Perhaps the greatest benefit that was derived from the Symposium came from the interaction between the participitants and the people of Glastonbury. B&B Hostesses were seen out on walks with their American Guests, and others offered to drive people to the airport. On Sunday evening at the musical event pictured above, we invited the B&B Hosts in for free. Perhaps the best example of this interchange cam with Elaine Butler, B&B Hostess to David Gallagher and Robert Ferré. 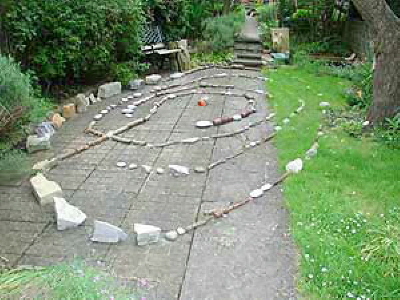 As a result of all the talk, she built a three circuit labyrinth in her back garden, and, on last report, is using it daily.